Like I mentioned in a previous post, I did a little cross-border shopping. I didn't go overboard.. mainly because of time constraints. I'm quite happy with what I did get though. And I'm happy with the money I saved! Everything is just cheaper in the US, it's worth the drive and the occasional long wait at the border. 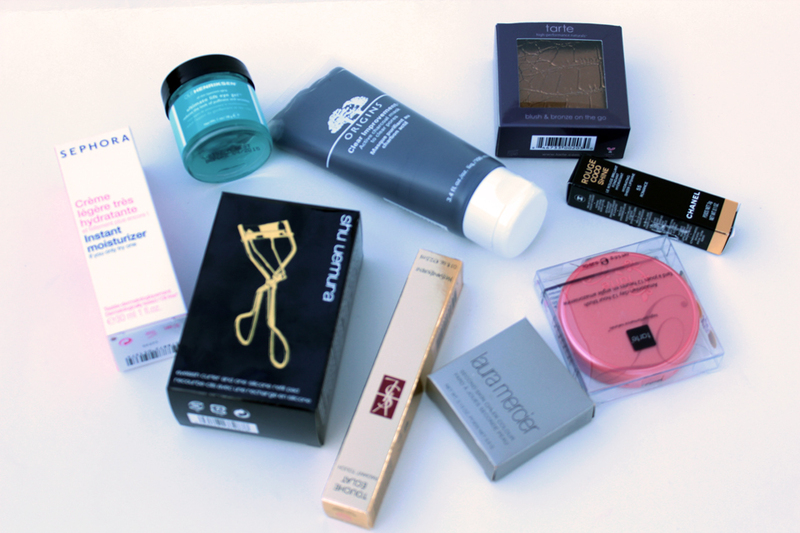 Most of what I got was beauty related. Surprise, surprise. It was just such a better deal, I couldn't help myself. Just for giggles, I'll list both CDN and US prices where applicable. Almost like rubbing salt in the wound of how much Canadian's get ripped off sometimes. Sephora Instant Moisturizer ($12 US / $14 CDN) - I've heard good things about Sephora's skincare line, so I figured I'd get a little travel size to try it out. So far, so good. Shu Uemura Eyelash Curler ($28 CDN) - I actually bought this from Holt Renfrew. I hear it's very hard to find these in the US ever since Sephora stopped carrying them. They're iconic. I don't think I need to elaborate. YSL Touchè Éclat ($40 US / $50 CDN) - I am going to give this another go! I don't remember what shade I got last time but I went with #3 this time. Laura Mercier Lush Nectarine ($24 US / $30 CDN) - This is a repurchase. I adore this peachy shade. Tarte Blissful ($25 US / $33 CDN) - I love these Amazonian Clay blushes, the hardest part about them is deciding which shade to pick up next. I went with Blissful this time. It's a warm peachy shade. Can you see a trend? Ole Henriksen Ultimate Lift Eye Gel ($38 US / $48 CDN) - My mom uses this and loves it, so I picked up. It feels lovely under the eyes. I am really enjoying the feel of gel undereye creams. I also have a de-puffing gel from Origins that I like. Origins Charcoal Mask ($23 US / $27 CDN) - This is a repurchase and it's great. It makes my skin look so clear and feel so refreshed. Tarte Blush / Bronzer Duo ($15 US / N/A CDN) - This was one of those impulse buys Sephora tempts you with while you wait in line at the registers. I thought it was such a good deal that I had to get it. It comes with two travel sized products: a bronzer and an Amazonian Clay blush in Dollface. Chanel Rouge Coco Shine in Romance ($32.50 US / $39 CDN) - This one is a bright pink. It doesn't have any shimmer, but it still has that glossy finish. 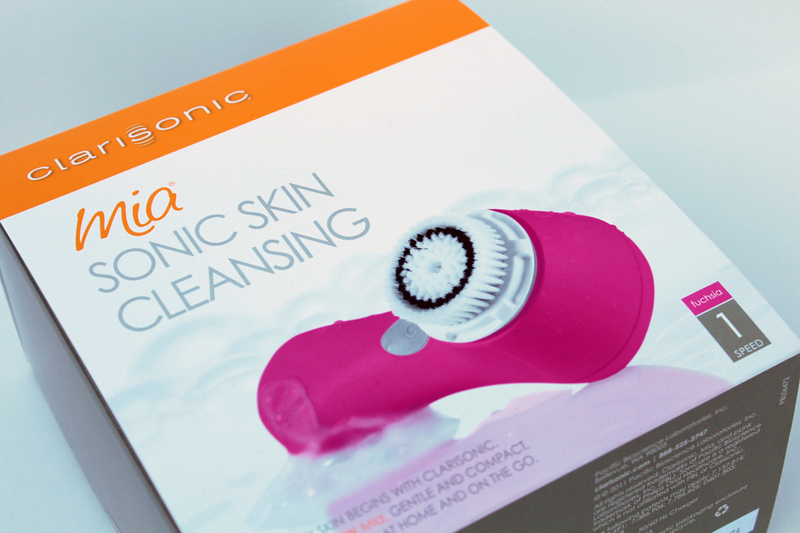 Clarisonic Mia, welcome to my face! I finally picked up one of these. I had the original Clarisonic, but when it came to repuchasing, I went with the little sister, Mia. For a couple reasons, first, I used the original Clarisonic for about a year before I realized there was more than one speed and after I discovered that, I didn't even use it. Secondly, I like the portability of the Mia. Much more travel friendly. Plus, it was less expensive at $119 US / $139 CDN. Win, win. I picked up a Fossil watch. 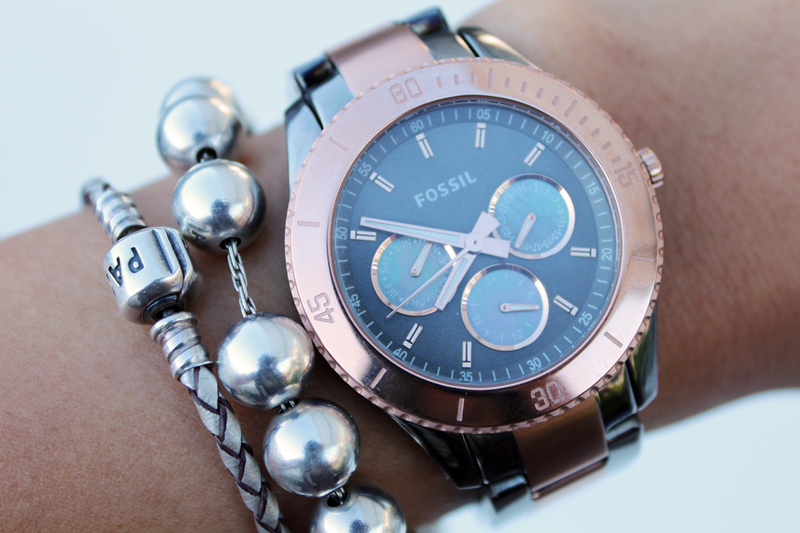 It's in the style Stella and it's two-toned: Rose Gold & Greige metal. I was going to purchase a very similar watch (right down to the same two-tone colours) from Michael Kors, but then I remembered that Fossil makes Michael Kors' watches. Plus, the watch I purchased was on sale & only came to $57 (taxes included). Quite a leap from my original choice for $300. Lastly my evil eye fave. I purchased a new Pandora charm. My first charm in what feels like forever. At least 6 months. I chose the evil eye because I love how it looks and I love the colours. I've been wearing it as a necklace lately. It looks great alone like this or with other charms on a bracelet. omgomgomgomg I love your Fossil watch! I did a blog post not too long ago about three Stella's I had picked out (and went with the brown stainless steel one). Wow that is an amazing price for that watch, I am very jealous! it is gorgeous. Overall, most things didn't have too big of a price difference, but when you add on our 13% HST it really does add up since state taxes are so low (and in some states, non-existent!). I would love if you follow up on your success/non success with the clarisonic, I've wanted one for a while now. I got a clarisonic mia 2 from my Aunt as a graduation present. I would love to read to watch your review on it. I feel like it really does get all the gunk of my skin. I'm breaking out right now, but I hope it's because "clarisonic is getting all the dirt out of the skin" or they say. Oh my, you have Laura Mercier's Lush Nectarine?! I've recently fallen in love with it. I've put it on my Christmas list!